First of all, I made the (defending national champion) Saint Paul team again. 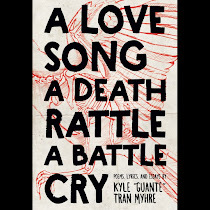 The Grand Poetry Slam was last night, and it was pretty wild. Khary took first. Someone told me I tied for second but I don't have the scores. It was a pretty great show-- lots of growth in our scene. For the record, I performed (in order): Handshakes, Cartpusher, The Family Business and Heartland. And yes, three of those titles are going to change when the poems are formally published. 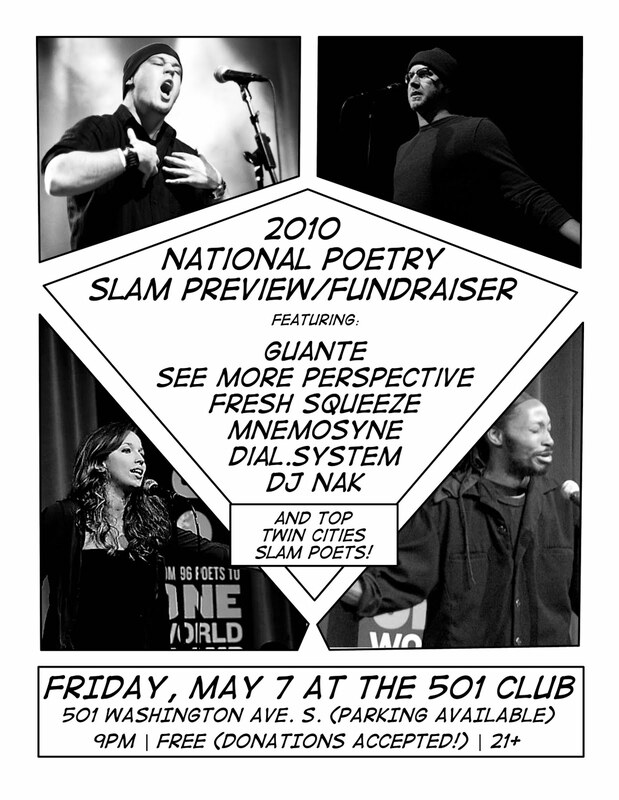 For those who don't know, the National Poetry Slam is in Saint Paul this year. It's a five-day festival of competitions, workshops, open mics and more featuring the top slam poets from around the country (and beyond). The fact that it's in the Twin Cities this year, coupled with the fact that our team (Saint Paul) took FIRST place last year, means that there's a lot of pressure on us to be brilliant. I think we have a great team, though: Khary Jackson, Sierra DeMulder, Shane Hawley, Sam Cook and myself (assuming the people who also qualified for the MPLS team don't go over there). It'll be August 3rd through the 7th. Here's the official website. Lots of fun events planned for before the big slam, though, including special themed slams every first Monday of the month at the Artists' Quarter, and also this event: Really excited about this lineup. Fresh Squeeze is literally that "best crew nobody knows about," and everyone on the bill is dynamite. And the show is FREE, so come out. Hey there, Guante, just wanted to say I saw you at the Slam last night. My sis and I thought you were the best there, and congrats on making it to the team!